A better fit to the stage of the Joan Sutherland Theatre, Richard Roberts’ set design has a regal, textured gleam of understated opulence. Clever use of twin turntables allows an effortless flow and a cinematic lens, with the set pieces moving even within scenes to support the storytelling and draw the eye to the key action. Director Rodger Hodgman is not only blessed with excellent performers but has also taken the chance to tweak and tighten the direction between the Melbourne and Sydney seasons. The skill of these leads means that their solo work feels like an intimate connection between audience and singer rather than basic stand and sings operatics. The characterisation of the minor male roles, however, remains muddily underwhelming. Matt Scott’s atmospheric lighting heightens the mood through the skillful creation of shadows and reflections on the sheer, semi-gloss walls. For the final scene, Scott depicts the reflection of a slowly churning river but is let down by the lack of any sense of where the river flows in the set. The climactic storm lighting effectively creates an uneasy tension. While this is ostensibly a traditional, faithful version of Rigoletto, some detractors have had troubles with the streamlined slickness of the sets and indeterminate period of the costumes. Seen as a companion piece to the current revival of The King and I, the stylised designs can be seen as theatrically representative rather than faithfully realistic. Once the showy gloss has been accepted, the performance can be enjoyed on the merits of the cast and music. Overall, a flashy traditional version is preferable to an over the top update that misses the point altogether. That said, even if Tracy Grant Lord’s costumes are viewed for their sumptuous overall effect, there is little defence for having the men dressed so similarly that they cannot be distinguished from each other. The quality of the music is at an absolute premium with the current combination of top class artists. Maestro Renato Palumbo delivers a vivid, dynamic rendition of the score, keeping tempi brisk and supporting the singers superbly. The Australian Opera and Ballet Orchestra is in fine form, enhancing the themes of the various characters with subtle variations in style. The opera makes a particularly energetic start, in part thanks to Italian tenor Gianluca Terranova’s expertise with rapid singing. The chorus action has been greatly improved since Melbourne, with plenty of lively, interesting action in the palace court. Another blessing on this evening is the surprise appearance of redoubtable company tenor Kanen Breen as Borsa. Breen matches Terranova’s rapid, precise delivery, and the flair of his individual performance style allows Borsa to actually stand out as a character from the sea of men in red. As the Duke, popular import Terranova is sterling form all night, singing high notes with such supreme breath support that the audience can just sit back and enjoy the sort of magnificent singing that can really only be appreciated live in an opera house. “La donna è mobile” absolutely brought down the house at this performance. Visiting Italian baritone Giorgio Caoduro also makes a welcome return, having impressed in 2012’s Lucia di Lammermoor. Although too young for the title role, Caoduro performs it so effectively that this is easily overlooked. 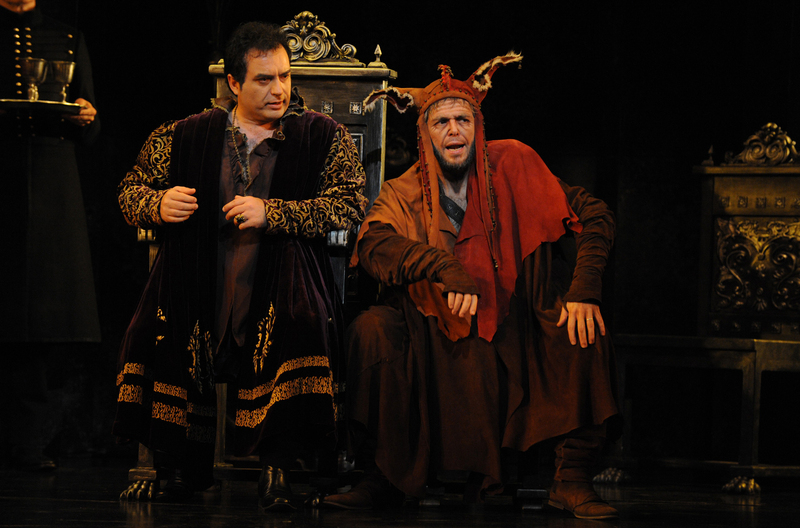 Caoduro inhabits the character fully, Rigoletto’s hump seeming to weigh down his whole body, both physically and spiritually. Caoduro expertly cultivates a sympathetic bond with the audience in act one solo “Pari siamo!.” Caoduro’s baritone has a rich, unwavering tone that is a pleasure to hear. Australia’s favourite nightingale Emma Matthews is in divine form as dear Gilda, singing with a silvery quality that leaves audiences slack-jawed in wonder. Possessing a skill that makes carefully rehearsed ornamentals seem spontaneous, Matthews is in especially wondrous form at the end of “Caro nome.” She also demonstrates incredible breath control when singing Gilda’s dying words while lying in a cramped position. Enjoying clear trust and chemistry with Handa Opera on Sydney Harbour La Traviata stage partner Terranova, the pair deliver a stunning ending to “È il sol dell’anima” when the very breath of the final shared note turns instantly into a tender kiss. David Parkin is a hulking presence as assassin Sparafucile, looking as though he could snap his victims in his bare hands rather than stab them. In complete control of his powerful bass, Parkin delivers a spellbinding final note to his introductory scene as he walks off singing Sparafucile’s name to an infinite pianissimo. In a striking plum dress and mop of red curls, Sian Pendry deftly performs Maddalena with the assurance of a highly attractive woman who knows the value and power of her sexuality. Pendry matches her physical characterisation with a sultry, tempting tone to her singing. The work of Terranova, Pendry, Caoduro and Matthews in act two quartet ‘Bella figlia dell’amore” is so good that it is difficult to choose which performer to watch. Dominica Matthews proves there are no small roles, miraculously projecting loads of character despite being constricted in a veritable nun’s habit as Gilda’s nurse Giovanna. Matthews’ antics as Giovanna tries to hurry out the Duke at the end of love duet “Addio, addio” provide some welcome amusement. The all-male chorus adds significantly to the musical quality, singing with precise dynamics and clear diction. Special mention for the offstage howling of the wind that contributes to the moody atmosphere of the approaching storm. 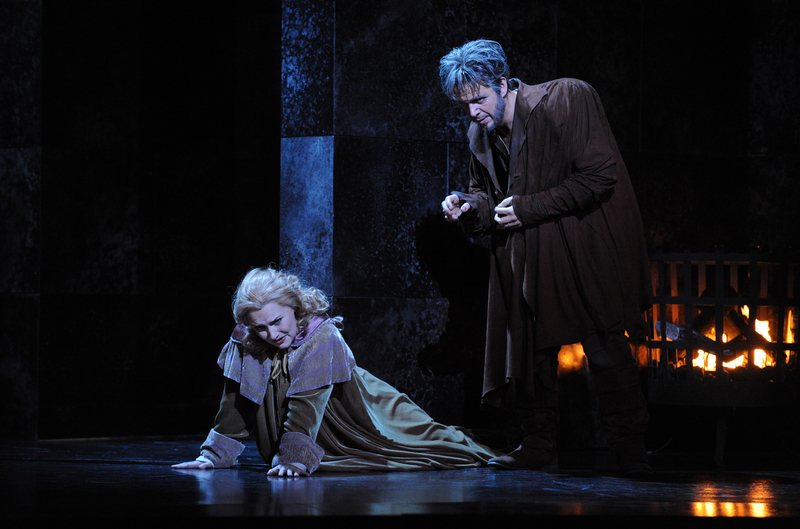 Opera lovers are sure to enjoy the magnificent performances in Rigoletto. Man in Chair also reviewed the Melbourne Autumn 2014 Rigoletto. 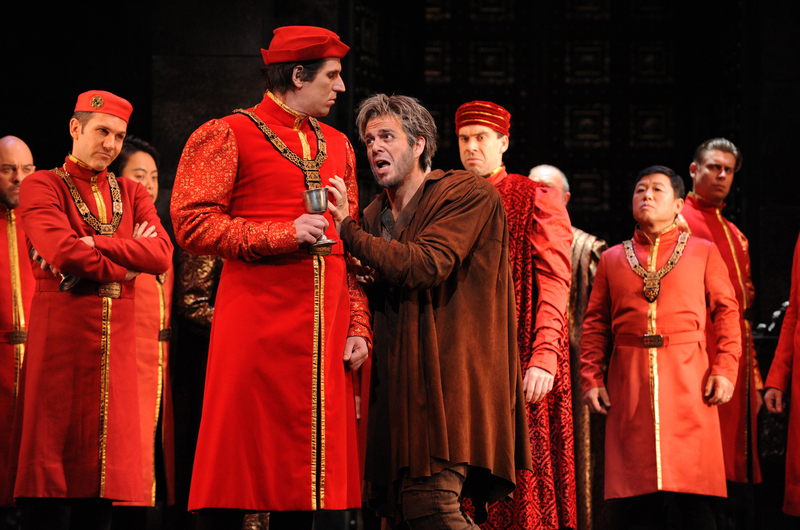 Rigoletto plays selected dates at Joan Sutherland Theatre, Sydney Opera House until 24 August 2014. Thank you so very much for your wonderful article of the magnificent performance of Rigoletto in Sydney Opera House!! We are great admirers of the thrilling, magic tenor, Gianluca Terranova and would like so very much to see his fantastic Duca on DVD, do hope that it will be avaiable later!! Wishing our grande Tenore and all the wonderful cast further great, great success and we are there in our hearts and thoughts in every minutes!! Wishing them all IN BOCCA AL LUPISSIMIIIIII! Many thanks Sir for your beautiful, most enjoyable article!!! Thank you for your comment Zsa Zsa, it is much appreciated! We have been so lucky to have a very good number of performances from Gianluca Terranova in Australia now, and every time he sounds magnificent! I always look forward to hearing him sing after hearing his first performance here in La Traviata. Such a thrilling voice! You would have loved to hear the cheers from the audience last night for Terranova – we all over his performance! Yes, Mr Simon Paris, how very happy we would be to be there in the public and hearing his magic Voice and most charismatic acting!! Thank you for your treasured answer, so very, very true!! Please, Please, Sydney Opera, bring us the wonderful pleasure, to make a DVD of this hystorical, wonderful Rigoletto in your great House!! It would be like, Xmas-, Birthday and every greatest celebration for all of us, who could enjoy live and also for the ones who were lucky enough to enjoy live!! Thank you so very much once again dear Mr. Simon Parris for your great article of an unforgettable, magic Opera Night!! Our grande Tenore, Gianluca Terranova is the sun of the sky of Opera!!! Nice review 🙂 The Melbourne Rigoletto was my first live opera in Australia, and I’m happy to see the production continuing in Sydney and being executed to an even higher standard. I love your comments on set design, lighting, and costumes, and your praise of the vocal part makes me want to visite Sydney and see the opera again! Not sure if you have been to Sydney Opera House, but the stage space is smaller so the set looks more lavish in there. Also, the Sydney auditorium rakes up more steeply than Melbourne, giving a clear, easy view of the set. Much as the singers were wonderful in Melbourne, the cast for the Sydney season are just that bit better. Emma Matthews’ performances are never to be missed! Even though Sydney was favoured here, Melbourne was fortunate to have Paolo Szot in Eugene Onegin. Looking forward to the Melbourne Spring season!